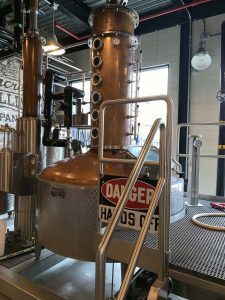 Seacrets Distilling Company (SDC) on the rise, creating new and delicious spirits. 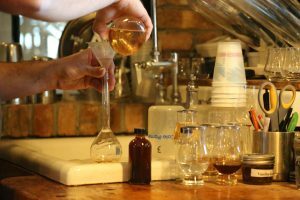 “Having the available time during the winter allows us to create these specialty batches that start out on a trial and error basis. We love working with the different recipes and getting the flavors right,” says Miller. While the term “downtime” is used loosely, the group of skilled men who run the distillery rarely find a moment where something doesn’t need to be done. 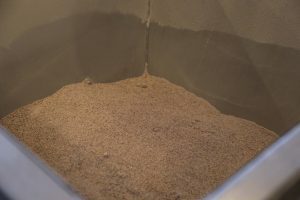 As Matt Albright and Matty Zavodny, distillers of SDC, prepare the locally grown blue corn to be transferred into the hammermill, Miller and his team took the time to answer some intriguing questions regarding the detailed process it takes to create the perfect specialty batch of bourbon. To start the process, Miller and his team pour the 350 pounds of corn into a hammermill, which grinds the corn. From there, the ground corn is sent through pipes down to the ground floor into the hopper. 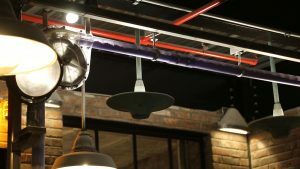 The hopper is a steel contraption that holds the grain and has another set of pipes connected to it that run to the mash tun. 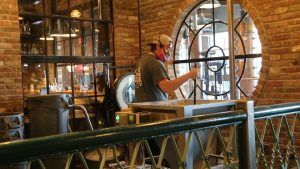 “The mash tun is where we cook the corn with over 175 gallons of 190° F water and enzymes. After about an hour, we lower the temperature and cook for another 30 minutes. 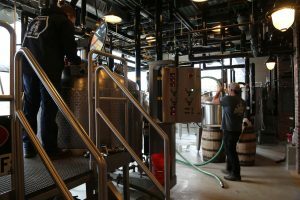 The bourbon mash is then transferred the to the fermenter,” describes Zavodny as he logs the day’s information into their data sheet. 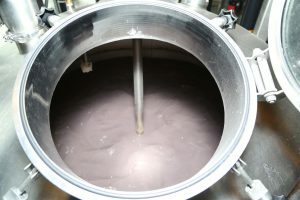 At this point in the process the wash is a rich deep purple/blue color from the blue corn. 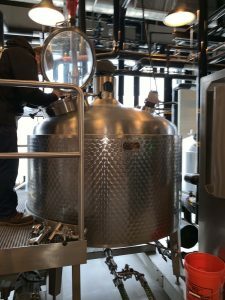 “The wash goes from the fermenter to the still. Once transferred, a process called “stripping run” is done four times. 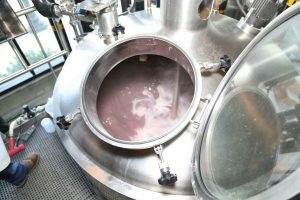 During this process the wash is cooked, concentrating the alcohol and flavors produced during the fermentation process. 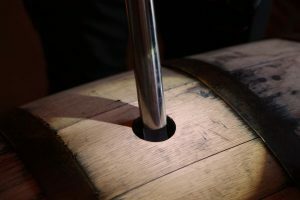 On the fifth and final “spirit run,” the low wines are distilled for the last time before barreling,” explains Albright while preparing the barrels and connecting the proper hoses. 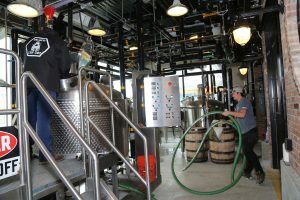 The 110 proof (now) clear bourbon distillate is shot through a hose from the holding tank to the barrels where it will sit for the next 2-4 years. 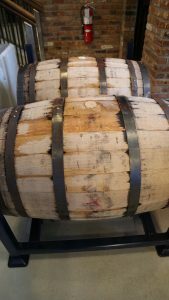 During this time the bourbon will develop its rich, dark brown color from the oak barrels that are charred on the inside. 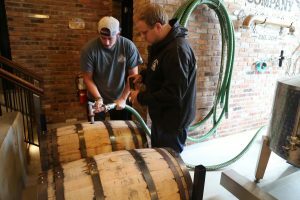 SDC crew plans to barrel five barrels of the blue corn bourbon and will test the bourbon every six months to monitor the flavors and development during the aging process. Albright and Zavodny have been with SDC for two and half years. Zavodny, while SDC was being built, followed Miller doing an apprenticeship prior to joining the SDC team. 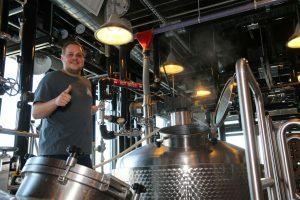 Albright, a former Seacrets’ barback, has a bloodline of moonshiners dating back to his great grandparents and always has had a passion and interest in distilling. 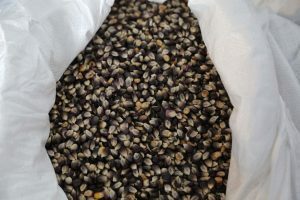 Within the next couple of months Miller and his team plan to create SDC’s first Rye Whiskey, Barrel finished Gin, Navy Strength 114 Proof Gin as well as a specialty batch Coffee Spiced Rum using Jamaican Blue Mountain Beans. 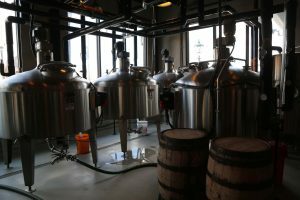 “The batch was originally intended to do a cold brew coffee vodka, but the flavors just weren’t right,” explains Miller. Matt Albright overseas the corn in the hopper. 2-4 years cant come quick enough! *For a full list of our awards and recognitions, please click here.